Federal investigators are asking questions about a high-profile Twitter hack last week that briefly caused the markets to drop by around $136 billion in value before quickly rebounding. 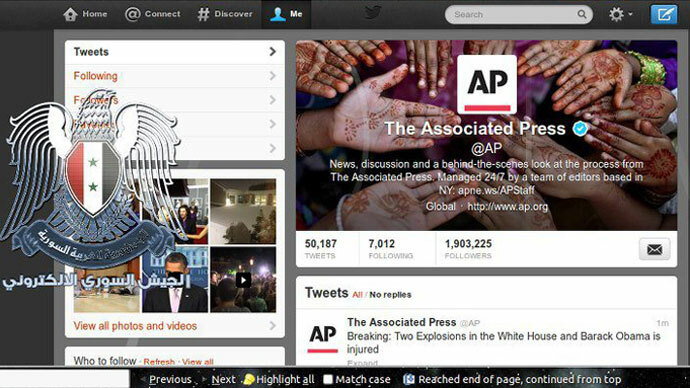 A fraudulent tweet sent from the official Associated Press Twitter account on Tuesday announced that United States President Barack Obama was injured following an explosion at the White House. In a matter of only seconds, the stock market took an immediate nose dive, with the Dow Jones Industrial Average dropping 150 points before the AP’s tweet was reported to be the work of a hacker. 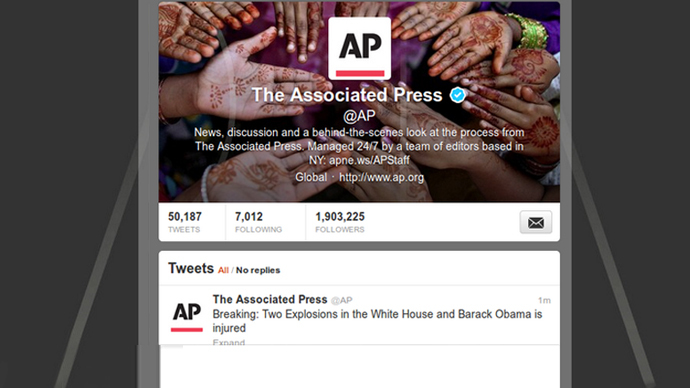 Moments later the AP responded, "The @AP Twitter account has been suspended after it was hacked. 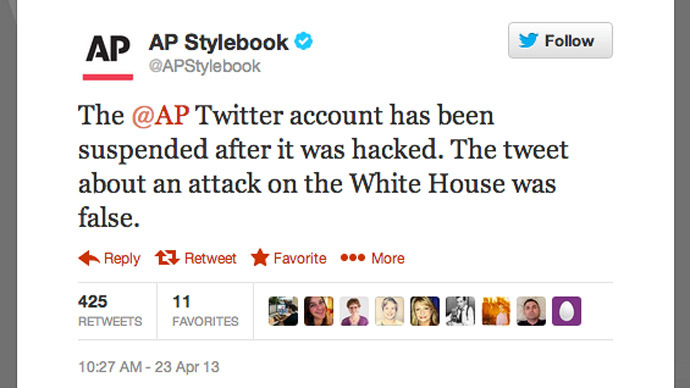 The tweet about an attack on the White House was false." It only took minutes for the markets to regain the $136 billion or so initially lost after the fake tweet was published, but federal authorities want answers nonetheless. A group of computer hackers supportive of Syrian President Bashar al-Assad, the Syrian Electronic Army, has taken credit for this compromise and others in recent weeks which have targeted western media for allegedly unjust coverage of that country’s ongoing civil war. 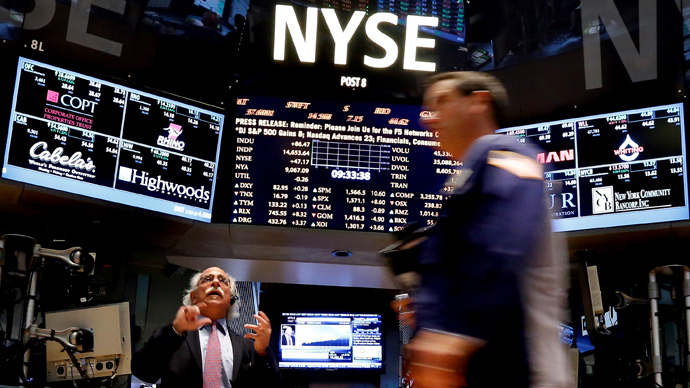 Without clear confirmation, however, authorities continue to ask questions in hopes of preventing another potentially catastrophic stock market crash. Bart Chilton, the commissioner of the US Commodity Futures Trading Commission, tells the New York Post that authorizes are examining a 10-minute window from last Tuesday that include the precise moment the fraudulent tweet was published. Although claims that the hack originated with pro-Assad hackers indeed plausible, Chilton says investigators need confirmation before they can jump to conclusions. According to the New York Times, the CFTC is now investigating 28 different futures contracts in hopes of seeing precisely how the hack impacted the markets. The New York Times adds that both the Securities and Exchange Commission and the CFTC are now conducting investigations into the compromise, and authorities plan to host a public meeting in Washington, DC on Tuesday to discuss what kind of safeguards, if any, should be implemented to prevent future compromises. 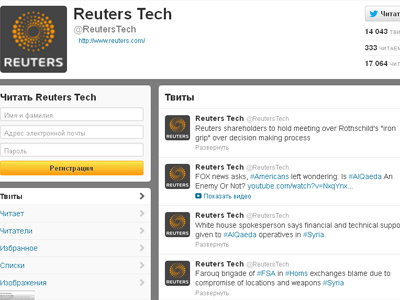 The Syrian Electronic Army has previously taken credit for hacking the Twitter accounts of the BBC, CBS News and others. 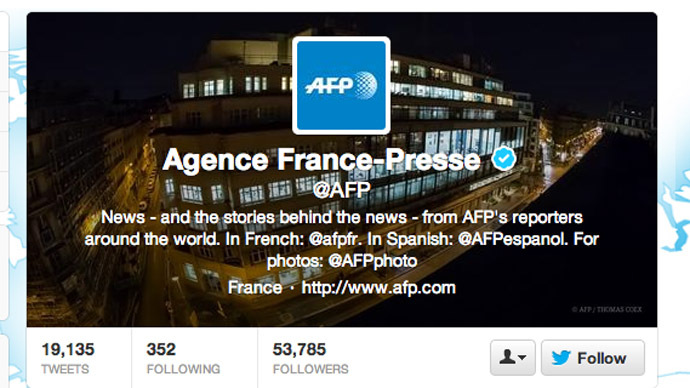 The AP’s main Twitter account and another affiliated one were both compromised last week following what employees say were “impressively disguised” phishing attempts to hack into corporate email accounts. The Federal Bureau of Investigation previously confirmed that they had opened a probe of their own into the matter.